Antec's existing Performance One series, peaking with the P183 and P190, has become a standard for silent, high performance computing. These enclosures have been extremely popular from the word "go," and for a long time the P180 and its descendants have been easy recommendations. But you could argue the designs are starting to feel a little outdated, and while Antec's recent Solo II was an interesting step forward, it felt like a tentative one. The new P280, on the other hand, is a major evolution. Intended not as a refresh of the P183 but to exist alongside it, the P280 features some radical changes for Antec in terms of design while lowering the cost of entry for the entire line. Is it a smart evolution, or did Antec's engineers split too many decisions in trying to appeal to both silent computing and high performance markets? Speaking candidly, I think any enthusiast worth his or her salt was more than a little interested when Antec first announced the P280. The Performance One line has practically been an institution for a long time, but Antec's engineers have gone back to the drawing board with the P280 in a very big way, implementing a host of new ideas while adopting some of the modern design cues brought forth by vendors like Corsair and SilverStone. I had a chance to meet with Antec's representatives, including one of the designers of the P280, and it's pretty clear where they were coming from when they made this case: as enthusiasts first who had the opportunity to design the case they wanted to see and use. Internal 6x 3.5"/2.5", 2x 2.5"
I'll concede that I haven't been wholly impressed by Antec's enclosures as of late, but the P280 is a completely different beast. It has the DNA of the Performance One series, but internally you'll find a design that diverges radically from its predecessors, and your first clue should be the nine expansion slots. 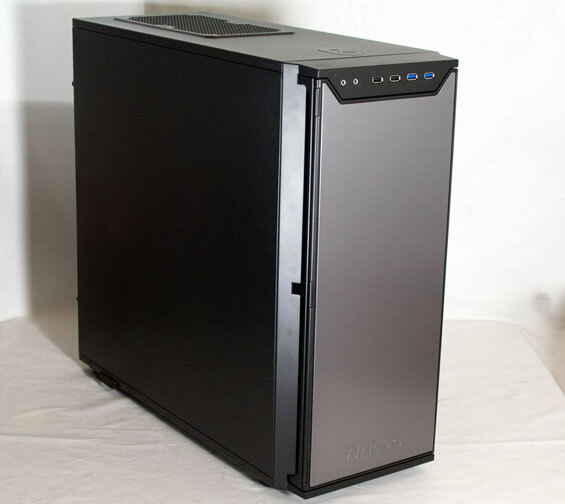 Antec calls the P280 a "super mid-tower," but at this point the lines between a mid-tower and full tower have been so heavily blurred that each enclosure should be taken on a case by case basis (pun wholly intended.) The fact is, the P280 is big, but it has a lot going for it. "While some people may be a little peeved at losing the dual chamber design of the P180 line, I'm not particularly bothered by it." I'm not. The dual chambered design is the main reason why I want to get rid of my P182. In my experience, the dual chambers have little effect compared to a standard design, but it makes it twice as difficult to assemble. I share the same feeling about the dual chamber design (at least on the P182), it's quite a pain to work on the lower chamber, everything is cramped and you have to be extra careful to not let the cables touch the fan that is in-between the hard drives and the PSU. After some time I removed the fan in the lower chamber. I've got only one HDD and the PSU is 80+ Gold (now), so I don't it any more. Still cramped, but much easier. Look at the Define XL by Fractal Design. I just bought one and it's great. It has two chambers too, but done right without a fan in the way. And it doesn't have the fans in the top so it's quieter - much better as long as you don't want watercooling or manual fan control. I don't. I've got the Define R3 and it has some issues like hard to close side plate, side plate screws not mounted on the plate itself (like they were on the Antec P150), too small reset button and a bit fiddly cable routing. I wonder a little bit about the CPU cooler. Would a cooler with a different configuration work better with some of these cases? Looking at the case it looks like cool air comes in at the front + bottom, turns 90 degrees gets heated by the gpu and then probably wants to exit mostly out the top which is blowing accross the cpu a bit. Another design of cooler might take a degree or two off.